Conventional wisdom says that consumers simply don’t like ads on TV. But what our study suggests is that they don’t like the way ads are delivered on TV. The online TV market appears to be settling on monthly or yearly subscriptions as its pay model of choice. One example: Hulu’s recent decision to discontinue it’s "free-with-ads" service and focus solely on it’s paid subscription tiers. 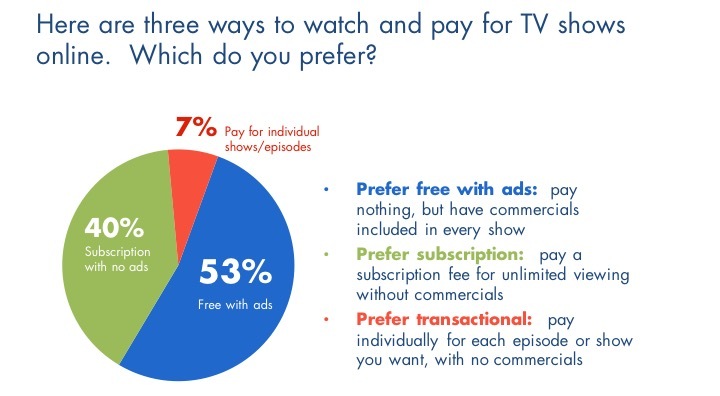 But in a new study from Hub, a majority of TV consumers (53%) say they actually prefer free TV, where they “pay” by viewing commercials. More than 8 in 10 (83%) of DVR users skip ads at least “most of the time”. That includes 60% who say they skip every ad. Two-thirds (68%) of DVR users say they will at least “sometimes” pause their DVR at the beginning of a live broadcast, so they can fast forward through ads. One-quarter (26%) say they do this “every time”. Majorities (52% to 56%) skip ads “most” or “every time” on VOD and online platforms, when fast forward is available. What’s more, when fast forward has been disabled on a TV platform, many TV viewers see that as more than just a minor annoyance. Nearly half (45%) say that fast forward disabling is a “major frustration”. Lighter ad loads: One ad per ad pod (rated as a 9.3 in terms of likelihood to pay attention to ads) was the highest rated idea tested. Targeting ads based on relevance or product interest: Ads more relevant to my interests (8.1), fewer ads but more targeted to me personally (7.1), and ads shown based on product categories I choose in advance (5.9) all scored higher than average. Gamifying the ad experience: Earn points for watching ads (8.2), earn promo codes for watching ads (7.3), and include countdown clock for when the show will resume (5.9) also received strongly positive scores. “Some networks have already started down the path of reducing ad loads on TV, but making the ads themselves more relevant to the individual viewer is a tool that will make ad-supported TV more effective for advertisers, and more enjoyable for consumers”,” said Jon Giegengack, Principal at Hub. Hub’s “2016: TV and Advertising” study was conducted among 1,206 US consumers with broadband, who watch at least 5 hours of TV per week. Interviewing was conducted in August 2016. An excerpt and infographic of the report are available as a free download from Hub Entertainment Research. Hub Entertainment Research is a market-research firm with deep expertise in television, movie, videogames, music, publishing, and sports—anywhere that entertainment and new technology overlap. In the television industry, Hub analysts work with networks, content producers, MSOs, and digital distributors. Our job is to help our clients understand the greatest risks and most-promising opportunities facing their companies and to reveal the clearest paths to success in a changing marketplace. For more information, please visit us at http://www.hubresearchllc.com.